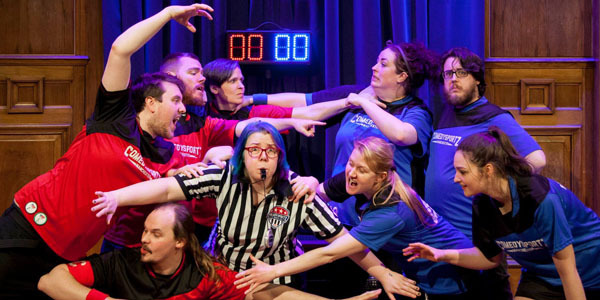 ComedySportz return to where it all began to celebrate 17 years of all action, all improvised competitive comedy. Two teams battle it out for your laughs with quick-witted gags, games, sketches and songs inspired by your suggestions. There’s a referee on hand to ensure a good clean match – it’s a family friendly show after all – with penalties for bad behaviour and bad jokes. Who wins? You decide! ComedySportz started at Chorley Little Theatre in 2001 and has since gone on to perform around the world. They always come back to Chorley to celebrate their birthday with players old and new. Fans of shows like ‘Whose Line Is It Anyway?’ will love this family friendly show!